Oakland is now the latest Bay Area city to consider a proposal to bar food vendors from serving plastic straws unless requested. Councilmember Abel Guillen, who introduced the proposal in March, says the legislation is part of broader effort in the city to reduce environmental waste. In 2006, Oakland adopted a policy called the Zero Waste Strategic Plan, which aims to dramatically reduce the city's waste disposal. "To make further progress on our waste-reduction goals and shift our culture away from single-use products, my ordinance will focus on 'by request only' use and better enforcement of existing legislation," said Guillen in a statement. Berkeley is considering similar legislation that would go one step further by banning single-use plastic straws altogether. Meanwhile straw-upon-request ordinances are already in place in Alameda, Davis, Manhattan Beach and Santa Cruz. Local environmental advocates say that anti-plastic straw ordinances would eliminate a key source of pollution in San Francisco Bay. “Plastic straws and stirrers are big culprits in trashing San Francisco Bay and our oceans,” David Lewis, the executive director of Save the Bay, told the San Francisco Chronicle last year. Straws have come under fire in some circles. But the issue with straws isn't that they exist, it's that they aren't always being disposed of properly. No matter what straw is made of, it should not end up as litter. The real challenge is making it easier for everyone to better dispose of straws and single use products by enhancing our recycling technologies. Environmental advocate Nicole Kozlowski told Forum that the industry has been pointing the finger at consumers for a long time. "We have surpassed the tipping point of how much plastic can be in the system and we can’t recycle our way out of this issue,” said Kozlowski, who is the co-leader of Rise Above Plastics, an initiative of the Surfrider Foundation. Straws are one of the top 10 items routinely found on beaches around the world, according to the nonprofit group Ocean Conservancy. Because plastic litter is not biodegradable, it ends up breaking into small parts that release toxins into the oceans, threatening the habitat of 500 wildlife species, including 23 endangered species in San Francisco Bay, the Chronicle reported. Seabirds for example can ingest as much as 8 percent of their body weight in plastic, which for humans “is equivalent to the average woman having the weight of two babies in her stomach,” said Denise Hardesty, senior research scientist at Australia’s Commonwealth Scientific and Industrial Research Organization. University of Georgia environmental engineering professor Jenna Jambeck calculated that nearly 9 million tons end up in the world’s oceans and coastlines each year, as of 2010, according to her 2015 study in the journal Science . “For every pound of tuna we’re taking out of the ocean, we’re putting two pounds of plastic in the ocean,” said ocean scientist Sherry Lippiatt, California regional coordinator for National Oceanic and Atmospheric Administration’s marine debris program. Some Bay Area cities are looking into reinterpreting current laws on the books to go after plastic rather than crafting new legislation from scratch. Santa Cruz, for instance, expanded a 2007 ordinance on food packaging to include straws, among other items. That went into effect in November of last year. 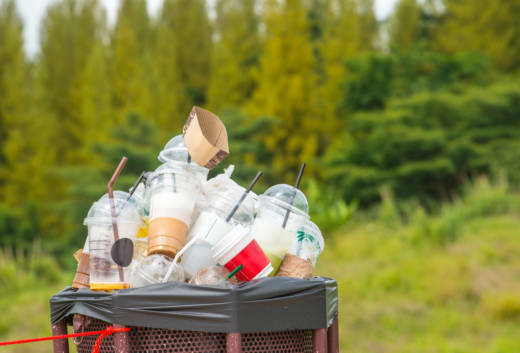 Because plastic is potentially recyclable, straws have traditionally been left out of the scope of these ordinances even though many waste-disposal sites don’t accept single-use plastic due to the high costs associated with processing it. Straws are especially difficult to recycle because their small size makes them difficult to sort, and they can clog up machines. Oakland, Emeryville and Albany have existing ordinances on waste reduction with similar wording to Santa Cruz, according to the East Bay Express. On the other hand, Richmond and Hayward’s ordinances explicitly exclude straws from their definition of “disposable foodware” and are therefore exempt from the ban. Bay Area legislation targeting single-use plastic straws is part of a growing effort in the state to curtail their use. An Assembly bill introduced in January would enact a straw-upon-request policy at restaurants statewide.